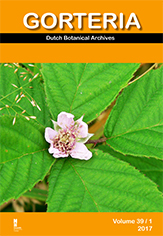 A new species is described here: Rubus psilops A.Beek et K.Meijer. It is characterized by very short hairs, which give the impression that the plant is more glabrous than it is. The leaves are very coarsely serrated, usually with a narrow rhomboid or obovate terminal leaflet. The inflorescence is narrow pyramidal or cylindrical, with leaves at the base only. Flowers small, late.